For those of you that are new to my blog, I like to feature occasional throwback recipes (I mean….WAY back) from my great grandmother’s cookbook published in 1892. There are so many amazing, unique, delicious, intriguing and downright bizarre recipes in this vintage treasure. I am having fun experimenting with these old keepsakes. 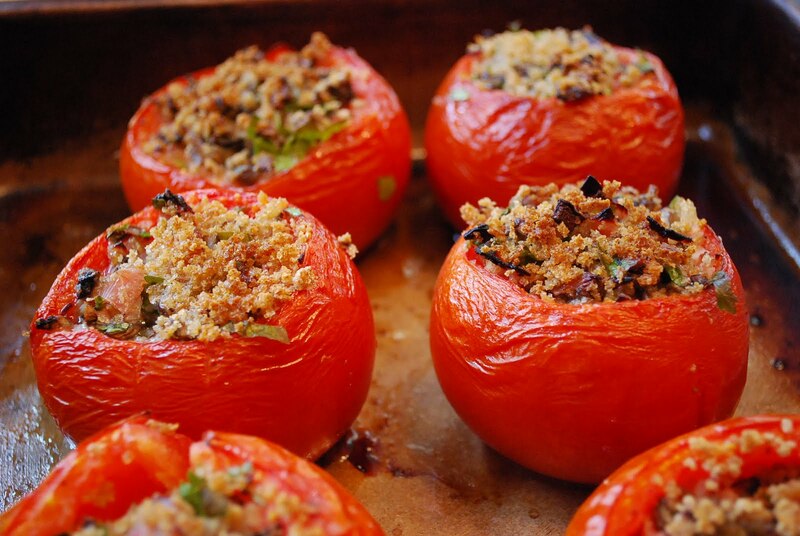 These baked stuffed tomatoes are my pick for this month and a perfect light, summer meal. 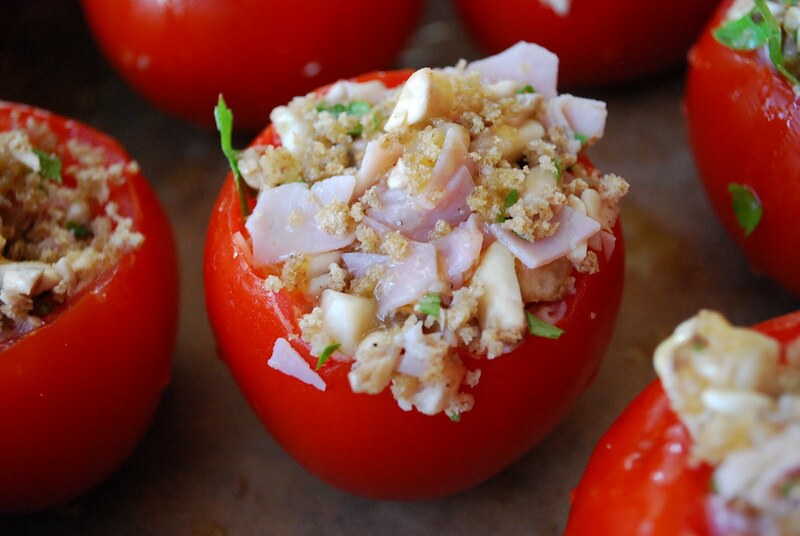 Also, a great way to use those ripe, garden tomatoes. I served the baked tomatoes with short grain brown rice. Directions:Preheat oven to 400 degrees. 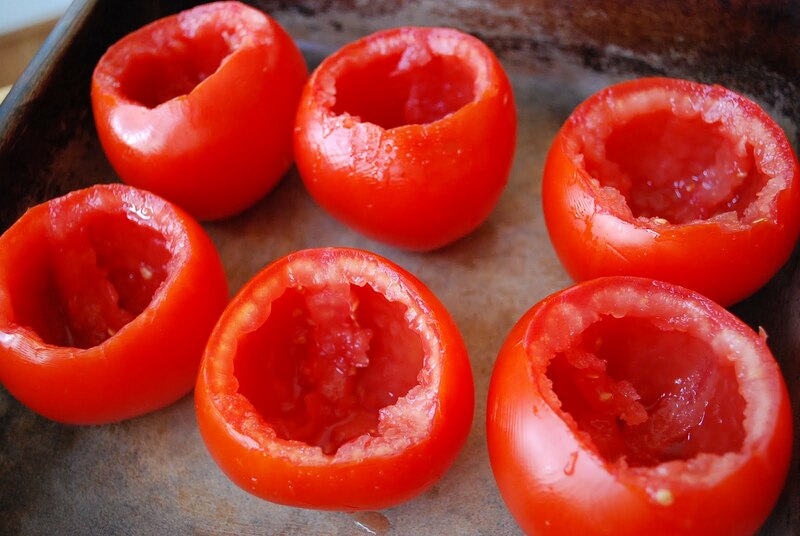 Cut a slice off the top of the tomatoes and scoop out the the seeds. 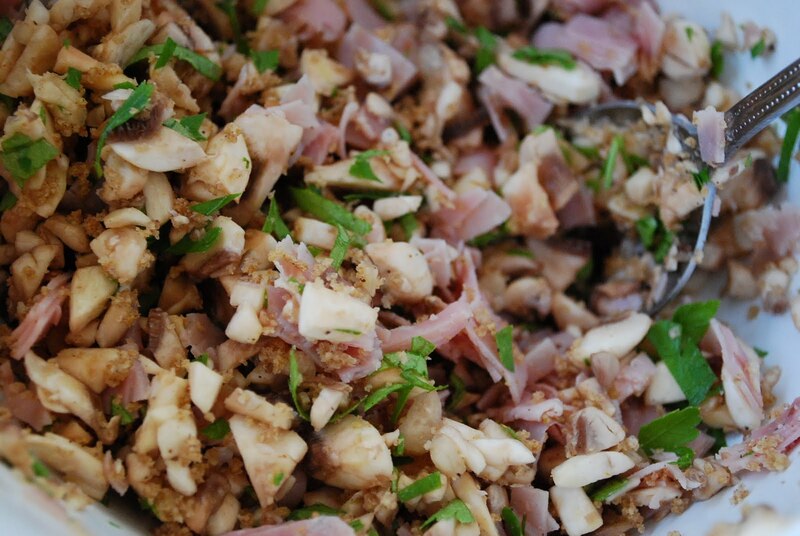 Mix together ham, mushrooms, bread crumbs, parsley, salt, pepper, cayenne pepper and 1 tablespoon melted butter. Fill tomatoes with this mixture, heaping it in the center. Sprinkle a little bread crumbs on top of each one and drizzle with remaining tablespoon of butter. Bake at 400 degrees for 35 minutes and broil for three more minutes, watching carefully to not burn. Serve immediately. 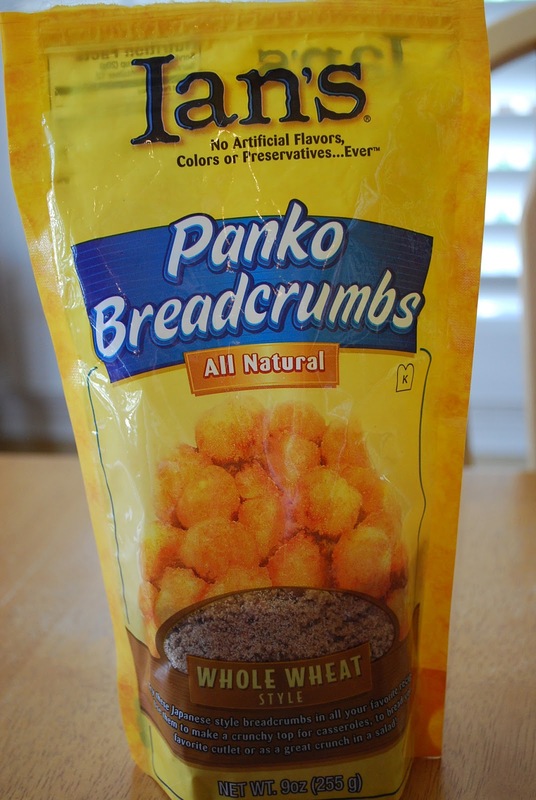 *I use Ian’s panko whole wheat bread crumbs. 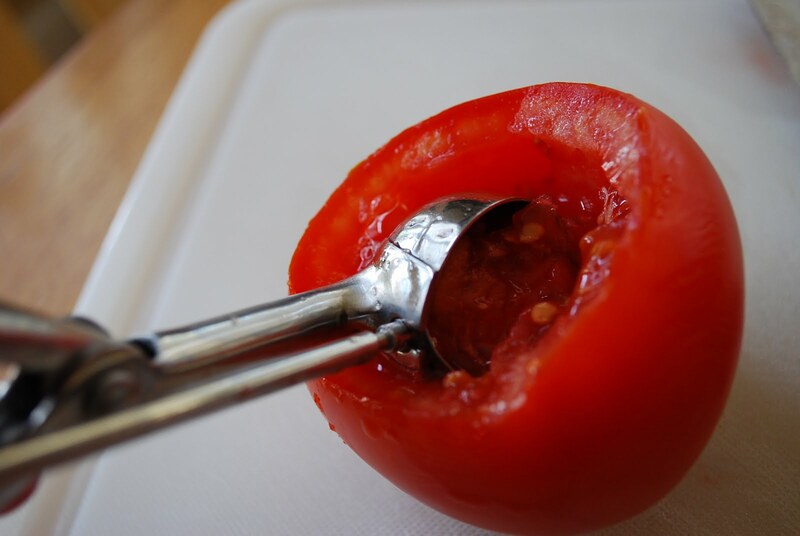 Cut a slice off the top of the tomatoes and scoop out the the seeds. Fill tomatoes with this mixture, heaping it in the center. Sprinkle a little bread crumbs on top of each one and drizzle with remaining tablespoon of butter. Bake at 400 degrees for 35 minutes and broil for three more minutes, watching carefully to not burn. This looks very tasty. I have a bumper crop of tomatoes right now and I’m looking for a new way to use them. I’ll give this a try. Thanks! Hi Amee!! Lovely space you have…glad following you! Thank you, Rohini! Please join my link party on Fridays and submit a healthy recipe. :) I look forward to browsing your blog!